Have a ferociously fun time with your favorite half-dinosaur, half-construction vehicles from Dinotrux! This multi-Pack of characters from the Mechazoic Era offers size and variety with die-cast Dinotrux characters Ty Rux, Garby, Ton-Ton, Skya, Revvit and Ace. All character vehicles feature rolling wheels for easy, push-around play unique to their on-screen personality and special abilities. Play out favorite moments or create your own Dinotrux tale! Includes Ty Rux, Garby, Ton-Ton, Skya, Revvit and Ace die-cast vehicles. Colors and decorations may vary. Play out favorite moments or create your own Dinotrux tale! 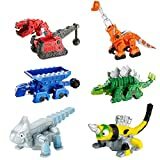 Interested in the Dinotrux Bundle - Ty Rux, Garby, Ton-Ton, Skya, Revvit & Ace Die-Cast Vehicles [Amazon Exclusive]? Is the price too high? You can easily price watch this product and we'll notify you when the price reaches your target.